KOKOMO, Ind. 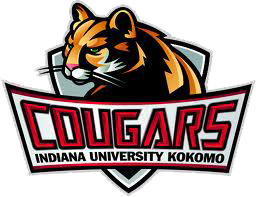 – Purdue University Calumet traveled to the Cougar Gym and quickly grabbed a 2-1 lead over Indiana University Kokomo in women’s volleyball. And that was it. In a night that saw just two lead changes and five tie scores over three sets, the Cougars dominated nearly every facet of the game as they topped PUC 25-11, 25-23, 25-9. With the Peregrines holding a 2-1 lead in the opener, a kill from Lindi Thomas (Parker City, Ind./Wapahani) tied the game at 3-3. PUC scored the next point, but Rachel Allen (Linton, Ind./Tri-West) countered with a kill to tie the game at four each. Three straight errors from Calumet and a rocket kill from Thomas put Kokomo up 8-4 – and they never looked back, cruising to the 14 point win. Set two may appear on paper to be close but it does not show that Kokomo jumped to a 6-1 lead on a kill from Elyse Younger (Fishers, Ind./Fishers) and led 22-12 victory in sight. But Kokomo’s cruise control turned into complacency as Calumet made a fierce comeback. The Cougars allowed three aces, had three unforced errors and allowed the Peregrines to dominate the net during a stretch that forced Hayes to call a pair of time outs. But just as PUC closed to 24-23, they had an error of its own to give the game to the Cougars. The third set saw the two squad’s battle to a 3-3 tie before Casey Colgate (Indianapolis/Lutheran) gave the Cougars the lead for good at 4-3. After Younger, Micayla Speidel (Columbus, Ind., Columbus East) and Allen rattled off three straight kills, Kokomo led 19-6 before holding the Peregrines to single digits in the set. Younger led the Cougars with eight kills. Thomas had a solid all-around game with seven kills, nine digs, two service aces and dropped all 12 of her serves in play. Speidel added seven kills. Cortney Hanson (Logansport, Ind./Pioneer) had 20 assists while Colgate added eight assists and a pair of service aces. Last week’s KIAC Volleyball Player of the Week and team captain Lael Larrick (Denver, Ind./North Miami) had 12 digs and was 9 for 9 on serves. IU Kokomo is back in action on Sept. 27 as they travel to Purdue University North Central for a 2 p.m. match. They return to Cougar Gym for Faculty Appreciation Night on Sept. 30 at 7 p.m. when they host Indiana University Southeast. This entry was posted in IU Kokomo. Bookmark the permalink.